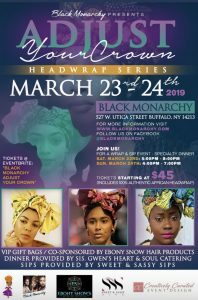 Over the weekend of March 23 and 24 Black Monarchy will premier their Adjust Your Crown Headwrap Series event, first of its kind in WNY during Women’s History month created by and for women. Join this colorful energetic experience as you learn to adjust your crown with beautiful authentic fabrics from Africa under the vibrant roof of the Black Monarch Flagship Store Located at 527 West Utica. There will be a hair care talk, live headwrap demonstrations, food by Sis. 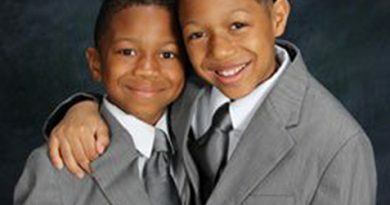 Gwen’s Heart and Soul Catering, drinks provided by Sweet and Sassy Sips and Platinum VIP tickets co-sponsored by WNY #1 hair care brand Ebony Snows Hair Products and Not to Mention some seriously authentic sister time! Tickets starting at $45 (includes 100% authentic African Headwrap) The two sessions are Saturday March 23 from 5 – 8pm., and Sunday March 24 from 4-7pm. More info go to www.blackmonarchy.com and follow on FB @blackmonarchy. Tickets on eventbright under “black monarchy adjust your crown”.